The third Kinleith Classic Vinduro, the final round of the Vinduro NZ Series was held at Ohakuri near Atiamuri in the same area as the famous Roger White trailrides of the 1970s. 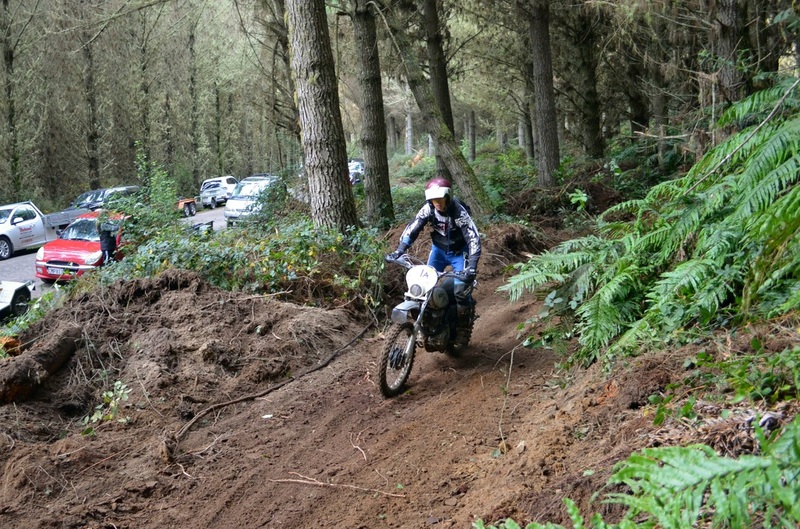 Once again we were blessed by fine crisp autumn weather and near perfect gound conditions for an enduro. Rain earlier in the week meant that although the famous volcanic loam was drying conditions were still slippery deep under the pines. Sean Clarke and the Forest Trail team had laid out two superb long two loops, one of 25 and one of 37 kilometres, each comprising tight single track, twisty bulldozed two track and some wide open but deceptively slippery winding gravel roads. Silver Grade riders were required to cover a very respectable 62km while Gold riders would repeat the first loop with times tightening for a total of 89 kilometres all up, more than many modern trail rides and a fairly grueling task, especially for riders on the oldest bikes that only offer around six inches of front and four inches of rear wheel travel! A great field of nearly 60 vintage enduro bikes were entered and once again the historic Ohakuri forest rang to the sound of aircooled two strokes and vintage air cooled four strokes. So too did Ohakuri live up to its reputation for some of the finest pine forest riding in NZ. The volcanic loam in places slippery, sometimes almost tacky and occasionally power sapping keept the riders honest as the course wound, ducked and dived through constantly changing elevations. Ohakuri requires constant changes of pace, deep breath zig zag uphills followed by buttock-clenching downhills, tight single track and slippery gravel roads with seemingly ever-tightening corners. As well as the comprehensive class structure there is an Overall Handicap classification run in Gold and Silver sections that allows for the technology of the bike and age of the rider. Even if a little hard to follow the system certainly is throwing up some very close results, with the first ten places in the Gold Grade spanning only 53 seconds, despite the age of riders ranging from 31 to 65 years and the bike age ranging from 45 years to a mere 15! The Kinleith Classic ended a very successful Vinduro NZ season comprising four diverse rounds from Northland to South Waikato. About 150 riders entered at least one round of the series showing that interest in vintage enduro riding is alive in NZ. Most heartening however was the spirit in which the events were conducted, full of humour and ear -to-ear grins all round. There was some very hard riding, you could almost say real racing and with smattering of ex NZ Champions behind some of the handlebars hardly surprising. All would agree however that at Vinduro the bikes are the real stars and the aim of keeping the old machines alive and kicking up dirt remains at the core. Go to the www.vinduronz.com website to find out about Vinduro classes. Video from around the 2016 course.....click pic to view.